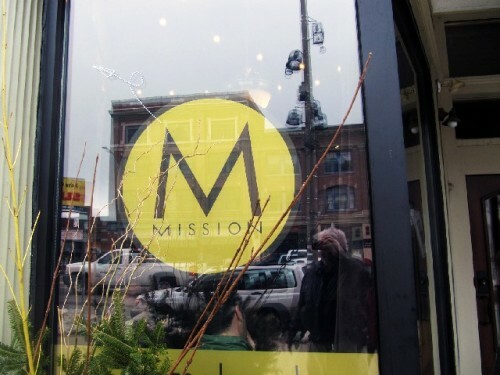 Mission Bar and Tapas on North Street in Pittsfield. 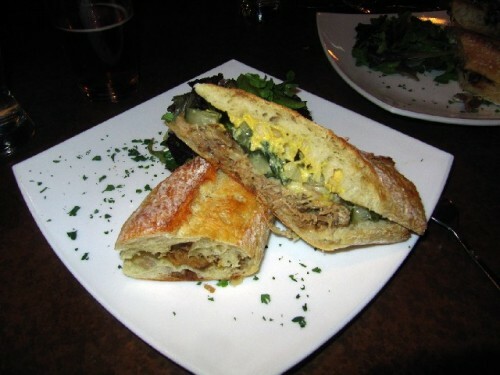 The delicious Cuban sandwich served with greens. Pancho enjoyed the steak and cheese sandwich. 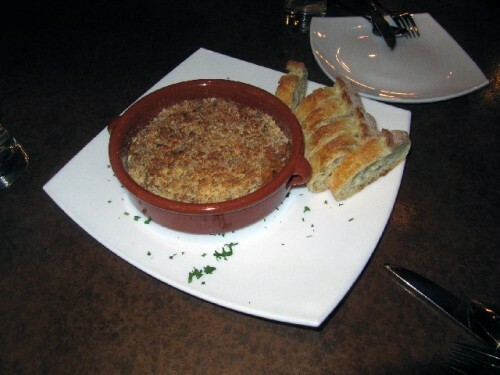 An incomplete cassoulet served as a bean dish without the meat. Sweetiepie ordered an authentic cassoulet at Mezze in Williamstown. The Toulouse recipe for cassoulet calls for duck confit and sausage. 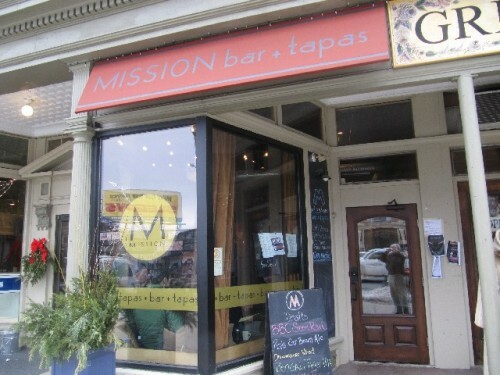 Mission Bar and Tapas has become a popular destination on North Street in Pittsfield with its combination of light dining, snack, drinks and live music in the evening. It will be a part of the 10x10 On North arts celebrations. Feb. 16-26. 9pm nightly. No cover. The line-up of singer-songwriters at Mission includes outstanding performers from the Word X Word festival and represents the best of the young talent from the Berkshires and beyond. Abbie Barrett (Feb. 16), Billy Keane (Feb. 17), Chris Merenda (Feb. 18), Melissa Brinton (Feb. 19), Glenn Geiger (Feb. 20), Jenna Moynihan (Feb. 21), Justin Allen (Feb. 22), Tom Gizzi (Feb. 23), Emily Mure (Feb. 24), Chris Vecchia (Feb. 25), Heather Maloney (Feb. 26). No cover. Recently we dropped by for lunch. It was a return visit for Pancho who has enjoyed Mission on several occasions and a first for Cisco. There was a light clientele in the large, rustic, open space. 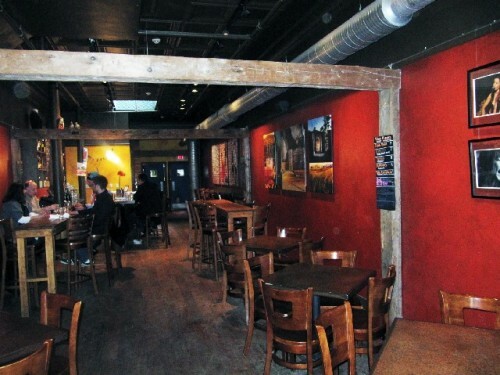 Framed photographs of local musicians and art with a Spanish theme comprised the somewhat austere décor. The waitperson was perky, fun and attentive. Overall the service was fast and efficient. Which is important when grabbing lunch during a work day. We decided on sandwiches. Cisco jumped first ordering the Cuban sandwich ($9). Pancho also would have preferred it but for the sake of diversity settled on the Steak and Cheese sandwich at $12. There were many options for tapas and pinchos (small items like olives and nuts). Cisco wanted to try the calamari. Looking at another table he spotted a cassoulet which is one of the daily specials. The waitress explained that she had just served the last order. There was no more sausage just the beans base. At a reduced price. We opted for that although Pancho was reluctant to try a French recipe in a Spanish restaurant. It is hearty winter food but tricky to prepare. We had both enjoyed it while in France. Or, more recently, for Cisco at Mezze in Williamstown. The sandwiches were quite wonderful. 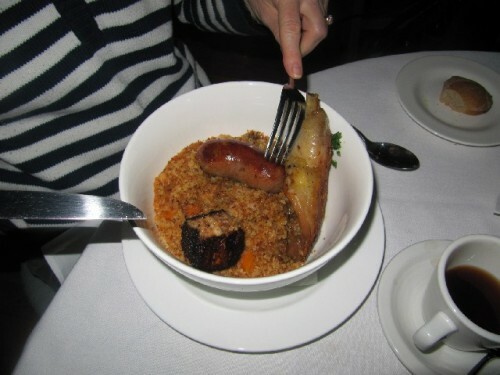 Cisco enjoyed the “incomplete” cassoulet as a variation of a bean dish. What follows are the observations of Pancho with a few comments by Cisco. Tapas originated in Spain. It stared in the 13th century with Alfonso X (23 November 1221 – 4 April 1284) was a Castilian monarch who ruled as the King of Castile, León and Galicia from 1252 until his death. He also was elected King of the Germans in 1257. His physician recommended a cure of drinking wine at intervals during the day. In order to have the wine he needed some food in his stomach. So the cooks would prepare for him a small meal or snacks. Between breakfast and a late night dinner he would have wine and tapas. When he was cured the king ordered that taverns serving wine must provide tapas. So it became a tradition in Spain. There is another tradition, starting in the 13th century. When drinking sherry, which is a sweet wine, it attracts flies. To keep them from getting into the glass, between sips, you cover it with a slice of bread or Jamón Serrano which is thin sliced, cured ham. It is Andalusian which is to say that the Moorish influence is really strong. As tapas evolved it entailed cured hams, sausages, spicy food, olives, octopus, anchovies to be eaten with bread and fruity wines. Other than sherry a good wine for tapas would be a nice, full zinfandel. The several hundred years that Islam was present in Spain (expelled by Ferdinand and Isabella in 1492) had an enormous influence on the culture including the cuisine. In Spain they eat late and for a long time. Never before nine or eleven and even past midnight. But during the day in the bars you have wine and munchies which we call tapas. The real tapas happens on weekends. In the Andalusian style the tapas is usually free during what we would call happy hour. There are all kinds of snacks set up along the bar. You pay for the drinks. Of course, here, you pay for the tapas which is not cheap. At Mission they serve you complimentary peanuts and pretzels. I have been here several times. Today was the best experience I have had. That little sandwich (steak) with the botanical (salad) on the side. Did you see how fast I ate and the expression on my face? You didn’t hear from me much. That’s when you know I’m doing good. 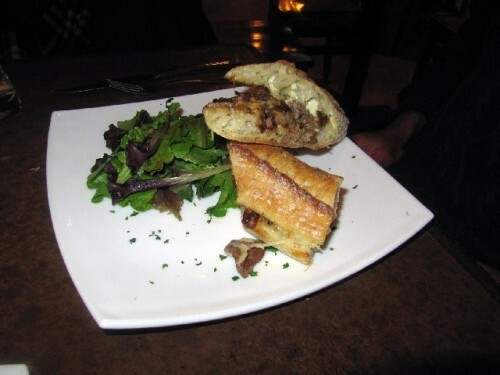 The steak sandwich was very tasty with a nice balance that I’m still working in my head. The right temperature. Fresh, with good crunchy bread. Next time I want to have the Cuban sandwich which you had. When I had a studio in Brooklyn in Dumbo there was a little Spanish place. They served Cuban sandwiches. You could see the pork cooking on Tuesday but it was really not going to hit the spot until Thursday. Real slow cooking full of juicy flavor, falling off the bone. Slow cooking all the way and recooked. Layers of the meat and cheese. Roast pork which is let to stew in its own juice. With oil or butter the bread is not toasted but rather fried. When the meat, cheese and condiments are all combined the sandwich is then pressed and grilled. It is flattened out. The best I ever had in Manhattan was a place called Victor’s. When I lived in New York I moved around from Brooklyn, to Alphabet City, to 73rd Street and Columbus. Across from my building uptown was a small place called Victor’s. My introduction to that sandwich was at Victor’s. When it became popular it moved to 52nd street in the theatre district and became expensive. I had a tech guy helping me with my computer system who came to my apartment. Once I said to him let’s go have lunch. He was Cuban from New Jersey. He had that sandwich and said “Oh man. This is the real stuff.” So I knew it was authentic. Another interesting cuisine you find in New York is Cuban Chinese. It is unique. When I worked at CBS that was my lunch. I call those restaurants Castillo Chino. There are a lot of them on the West Side. One of the best of them was a hole in the wall. On the menu there would be Chinese on one side and the Castillo Chino on the other. I tell you what. The Castillo Chino just wiped out the Chinese. Oh man. And I like Chinese food. But the difference was incredible. The confluence of Asian and Caribbean. When two cultures meet one of them is going to suffer. It’s called the vertigo of relativity. When you embed yourself in a culture that is totally different from your own something is going to give. It’s like that film At Play in the Fields of the Lord where fundamentalist Christians are sent as missionaries to the Amazon. Cisco recalled a similar phenomenon in Shanghai. Until the invasion of the Japanese during World War II it was the most cosmopolitan culture in China. There were large European colonies of businessmen in the city. The chefs adapted special cuisine to please this clientele. While in Shanghai we were taken to a private club by a wealthy artist. There were several Germans in our group and the artist asked the chefs to prepare something special. The result was a typical German roast pork shoulder but cooked in a Shanghai style. When in New York Cisco has dined in a Shanghai style restaurant in Chinatown and enjoyed this unique cuisine. Getting back to Mission Tapas Pancho described it as salon tapas. Which is to say, good, enjoyable, but not what one would find in a bar in Spain. Cisco asked for an opinion of the cassoulet, a French dish, served as a weekly special, but in this case without the sausage. Just the beans. There is no way I can talk about the cassoulet because it is incomplete, Pancho commented. It is lacking essential flavors. Cisco however enjoyed it as a nice bean dish with, as Pancho put it, a touch of heat compared to the French version which is rich in garlic. It is in fact a complex dish to prepare and the Toulouse version calls for duck confit which makes it expensive. The Mission preparation avoids those expensive ingredients. 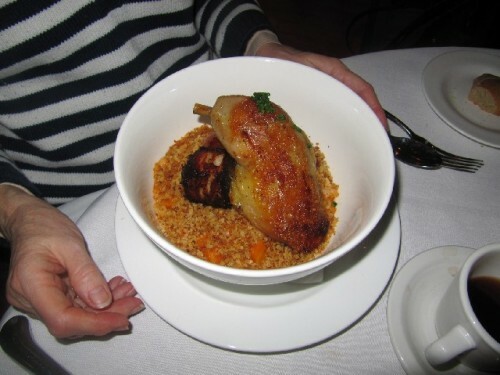 But Cisco sampled his sweetiepie’s authentic cassoulet at Mezze in Williamstown. As an overall rating from one to ten both Cisco and Pancho rate Mission Tapas at seven. A bit pricey for small portions but a popular, cozy and inviting place. Both sandwiches were superb and on return visits we would try the enticing specials. Cisco would take another shot at the cassoulet while Pancho will pass.